Here are five RANDOM things floating around my head! Not only do I have fabulous friends, my kiddos do too!!! Smith came over to play yesterday and ALL three of my kiddos loved playing with him. Yesterday before school the kiddos wanted to have their picture taken. Sometimes I'm overwhelmed by the amount of pictures you must take in order to get a good one of all three!! I should have grabbed that passy out of B's mouth!! Ebby Lee asked to take a picture of me and the boys....hahahahaha!!! How did I NOT know I was covering Bowen up?? Next week is BIRTHDAY WEEK in the Slaughter house!!! This guy turns 4 on Saturday! This girl turns 5 on Wednesday!! I snagged the Shimmer (pink) Downy Unstopables at the grocery store yesterday and am DYING to do a load of laundry. Can't wait to see how that smells!!! Oh goodness! I loved all of these pics! Smith had THE BEST time on Wednesday (the fact that he came home and told me he wants to be a Slaughter from now on was the the biggest clue...). And I need some of those Downy things...like today! OK...I can't wait for you to start Scandal tonight and then next week, all 5 of your things are going to be about Scandal. That's my prediction ;). I love how you get group shots of the kids so often!! And you look beautiful in the photos with the boys! Love the pics of you and the kiddos on the stairs! Y'all are just so dang cute! And I'm going to have to try those scents! They look awesome! Ok I may just have to get some unstoppables this girl loves scents! You should do a post on your skin/ makeup routine. It looks so pretty in pictures. Your kids are adorable! 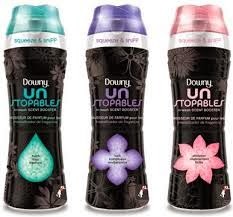 I think I am going to have to try out the Downy unstopables. That picture of E and N kissing on B is SO stinkin cute!!! Always love the pics of your adorable kiddos! Those unstoppables sound amazing and I am all about scents so I am putting them on my next Target run list!!! Love the pics! And I love that someone else besides me says passy! My husband and I call it that, but everyone else calls them binkies or even plugs! You have such cute kids!!! I love the pic with you and your boys. You look beautiful. Your hair hiding Bowen's face cracked me up!!! Love those pics of your sweet kids! So cute!! Love! If you love the smell of the unstoppables, put a small amount in a small mesh bag (like those jewelry gift bags) and hang it in your closet or put in a drawer. It keeps the great smell going!